Most people don’t think about eating evening primrose because they associate this plant with its healing oil. This wild plant is indeed medicine but it is also a great source of food. Evening primrose (Oenothera biennis) is a biennial and collecting the roots while it is still spring means you get sweet, succulent and somewhat fleshy root. This plant grows a big root, some of them the width (and appearance) of a parsnip and once washed, you can eat them raw if you wanted to. You can collect roots later in its growth but they won’t be as fleshy as they are now. You’ll find evening primrose in waste areas, meadows, on beaches, in dunes, even along roadsides. This versatile plant is native to Canada and the US and grows in all provinces (not the territories) and in most states. It has been naturalized in Great Britain, parts of Europe, and it also grows in Russia, eastern Asia, South American, Australia and some Pacific islands including New Zealand. You won’t find this plant in the shade because it loves full sun. The best part of all is that evening primrose is drought tolerant so no matter how hot your summer may get, it’ll still grow. The leaves of the second year plant can be used in any way you prepare greens in the kitchen, the roots can be eaten raw (in small quantities) or roasted, the flowers taste amazing so toss them into a salad and the seed pods while they are young can be roasted. Even young stems can be used in the kitchen to create some amazing meals. Evening primrose contains protein, carbohydrates, beta carotene, calcium, potassium, and vitamin B3. This plant also contains high levels of gamma-linoleic acid (GLA) which of course is an Omega-6 fatty acid which is important in supporting the immune system. The body converts GLAs into prostaglandins, hormone-like compounds that help regulate many body functions. The seeds are a great source of the amino acid tryptophan which our bodies convert into serotonin, the mood improving brain chemical. Lastly, the leaves are a great source of the bioflavonoid quercetin. This keeps our blood vessels healthy, improves circulation and it can ease the effects of asthma. English settlers in America took the seeds back to England as early as 1614, and in the decades following, evening primrose was grown in both English and German gardens for its nut-flavoured roots which were boiled like parsnips. In fact, in the 1880’s the evening primrose became a very popular garden vegetable in Germany. 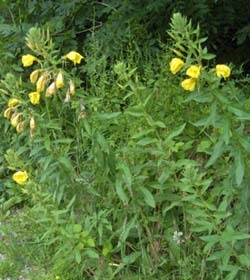 Native Americans used evening primrose for a variety of medicinal purposes. The Ojibwa poulticed all parts of this plant for use on bruises. The Cherokee drank a tea made from the root to help lose weight. The Forest Potawatomi considered the seeds a valuable medicine, but records documenting its use have sadly been lost. European settlers started using the plant as medicine in the 1700’s. The Shakers used the leaves or roots externally to promote healing of wounds and a tea of the leaf and root to settle an upset stomach. Sterilize a glass jar and lid. Collect evening primrose flowers that are free of any dew or rain (they must not have any moisture) in your glass jar. Be sure to fill the jar (do not stuff). Using a carrier oil of your choice (olive oil will do), pour oil into the jar until flowers are covered in oil. Poke the flowers to ensure there are no trapped air bubbles. Cover and let sit two weeks. Shake daily. After two weeks, strain the flowers out. Use this oil to help enhance the nutrition of your home made salad dressings! Evening primrose is food and it is medicine – be sure to discover its goodness this year! Check out the link here to see what this amazing plant looks like throughout the year. to find another person with some original thoughts on this subject matter. something that’s needed on the internet, someone with a bit of originality! Great to have come across your site. I was doing an internet search to find out how to extract oil from the seeds but now I know I can do so much more, I will try it all out! I recently found what I hoped in this website, thank you for your had work,know it in the least. Nice job. so much info, i learned alot. Do you know if you can eat the showy evening primrose? Does it have the same nutritional value? I do not think these are edible. They do not come up in any book or search I have done that indicates these are a food source. Can I use the leaves for tea? Hi, what ate your sources for the Native American uses of this plant? All sources are listed below the article! Can you use dried evening primrose to make the oil? Not to my knowledge – you need fresh I do believe. Your article is very good, me and everyone have more useful information. Primrose flowers are one of my favorite species, they bring a very sweet taste and bright colors. Evening primrose is a biennial meaning its life is only 2 years. The first year is only a rosette of leaves on the ground and it does not grow a stem… that is year two. Then it produces leaves you can eat! Leave the rosettes so it can get to year 2 of growth. Interactions are usually when plants are used medicinally and the person is on pharmaceutical drugs. There are many plants that should be eaten in small amounts only – especially if a person may have kidney issues. Can the stemless evening primrose be used in this same manner? Are you meaning the first year of the evening primrose or another species? If so what is the Latin name?